»Competition»Béar Féile 2015: Mr Bear Ireland 2015 Competition! Béar Féile 2015: Mr Bear Ireland 2015 Competition! Another great event in the Bear Féile 2015 line-up, presented by Dublin Bears! 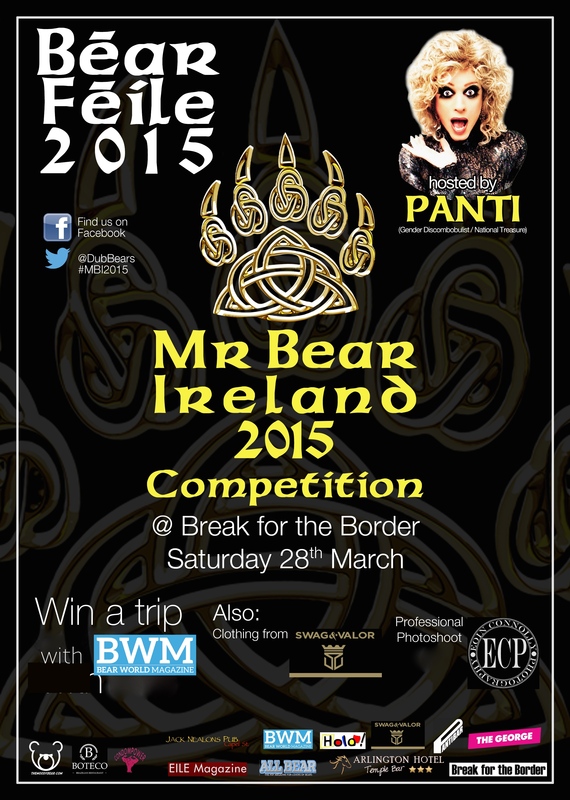 The Mr Bear Ireland 2015 Competition, MC’d by fabulous national treasure Ms Panti Bliss, will take place on Saturday 28th March at Break For The Border in Dublin 2, at 9 pm, and the lucky winner will receive great prizes, including clothing from Swag & Valor, and a professional photo shoot from Eoin Connolly Photography ! But c’mere, there’s more!! Also for your delectation on the night will be WOLF and DJ CORKY. (Please Note: The Mr Bear Ireland winner must live in Ireland, and must be readily available for photo shoots and publicity).